Hello, hello. 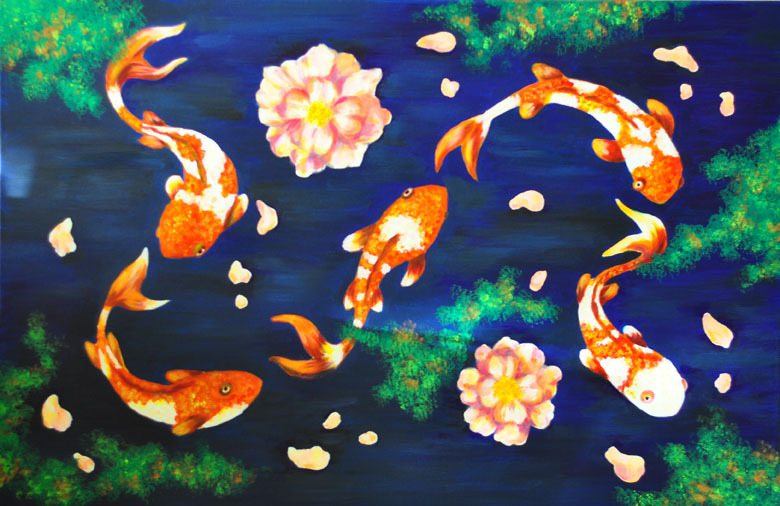 This is an acrylic painting I made for my friend Mayu who is going away to Canberra. It's a going away present that she requested and she paid for the materials. She said she was happy with it. I was quite pleased with how it turned out. She picked it up two days before the opening and I just haven't had a chance to post the picture up. This is the first acrylic painting I completed since 2009. Woo hoo! Check it out...I can paint a whole fish without the fish bones showing! A scorcher today in Melbourne. I need to do some work after some chores. Your friend is most fortunate to have this happy, cheerful and beautifully composed painting. Look, ma, no bones! This is so gorgeous! Oh MY! Such beautiful flow, lots of grace. And the colors! Very deep and rich. Really gorgeous. Your friend is very lucky.